← When You’re Hot, You’re Hot! Just like I tend to do more than one thing at a time (multi -tasker or ADD?? ), I expect my products to do the same. I already have my favorites, which I will share with you, but decided to take a foray to my local Sephora and see what they, with their vast experience, think are the best multi-taskers. For this expedition, I invited my friend Clare, who is fascinated by the transformative powers of skincare and cosmetics, but is that rare creature, a Sephora Virgin. I sweetened the invitation with a promotional discount card, one for each of us, for 20% off anything. I observed Clare as we entered the holy grail of cosmetics and saw the visible affect it had on her. She smiled in wonder and delight, her eyes sparkled with amazement and her breath caught in anticipation. That was the last I saw of Clare for an hour as she quickly formed a bond with an experienced saleswoman and they found common skin and makeup issues. When we met up again at check out, she had a shopping basket full of bounty. I sampled various products at the suggestion of my sales person and pumped her for recommended multi- taskers as well as what was new and hot. Hands down, the best selling cosmetic is BB Cream. It acts as moisturizer, primer, makeup and sun screen. Sephora carries so many, but my favorite is only available at a Kiehl’s counter or stand alone, Kiehl’s Skin Tone Correcting and Beautifying BB cream. Besides hydrating, concealing and correcting skin tone with lightweight coverage, it is loaded with Vitamin C, and packs a walloping 50 SPF. This takes the place of my sunscreen, moisturizer, Vitamin C serum and makeup, saving me both time and money. I consider it a bargain at $37. Susie Sales Person’s fave was a treatment product, Dr. Brandt’s Pores No More Anti Aging Mattifying Lotion, $60. This delivers both anti aging and pore minimizing benefits while mattifying oily, shiny skin for a velvety finish. 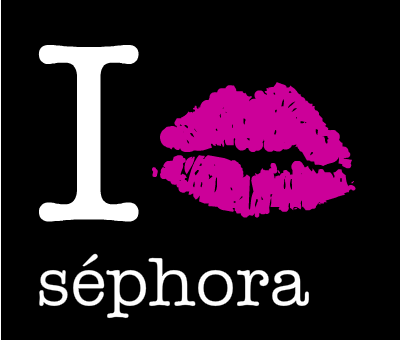 Sampling is my favorite part of shopping for cosmetics and Sephora lets you roam freely with testers for all skin care and makeup brands. Next we tried Perricone’s No Bronzer Bronzer, $35, a glow getter with SPF 30 and Perricone No Foundation Foundation Serum, $55 which treats, covers and protects with Vitamin C and SPF 30. SO many lines now inject their cosmetic and skin care with SPF that plain old sunscreen is practically obsolete for the face and neck. If it’s a no makeup day for me, I am good to go with Neutrogena Rapid Wrinkle Repair Moisturizer with SPF 30, $21.99 or SkinCeuticals Physical Fusion UV Defense, $34 a weightless, radiance boosting fluid that protects with SPF 50 while helping me look slightly better than bare. Never, ever leave the house unprotected. Sunscreen is the best anti- ager out there. 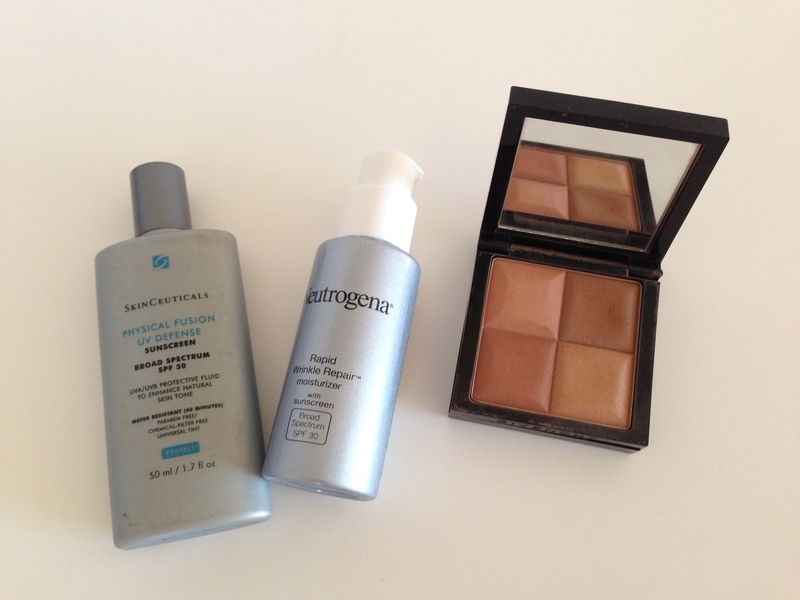 My old standby is Laura Mercier Tinted Moisturizer SPF 20, $43 which predates the BB revolution and is still a winner with sun protection and light makeup coverage in one tube. It comes in 15 shades to cover every ethnicity. I’ve used it for years. On a previous trip to Cosmetic Paradise, I was tipped off to Givenchy Le Prisme, $47 and it quickly became indispensable. This elegant compact holds 4 luscious matte shades. I use individual shades as eye shadow, the darker ones as contour, lighter shades as blush, or swirl my brush around all four as a subtle bronzer. It comes with its own little sable brush. Genius! Friend Wendy turned me on to NuSkin ageLOC Gentle Cleanse and Tone. As the name makes plain, it’s a one-two cleansing punch, no need for separate toner after washing, and infused with their ageLOC technology which targets the sources of aging. I love the slight citrus scent of this foaming cleanser, available through NuSkin Reps for $45. And lastly, when I need to get my glow on, I reach for a luminizer, used right from the bottle to highlight cheek bones, under the brows, mid forehead and the center of the chin or mixed with foundation to make my own illuminating makeup base. 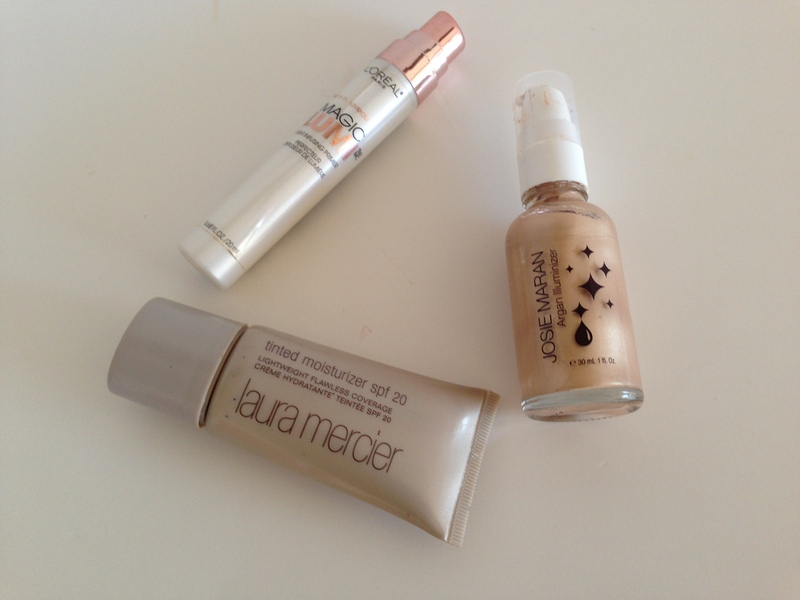 L’oreal’s Magic Lumi, $12.95 , a light infusing primer adds a pearly sheen suited to winter while Josie Maran’s Argan Illiminizer $28, gives a bronze luster, perfect with a summer tan. Susie S.P. says the best selling brands for anti- aging are Perricine, Algenist and Derm Dr. She said Derm Dr. contains more hyaluronic acid than any other brand but it was sold out so I missed a sampling opportunity. Obviously a coveted product for thirsty skin with nary a bottle in sight. She also recommends Kate Somerville Mega C Dual Radiance Serum, $90 with Vit. C, Omega, 3,6,7,and 9 for radiance, hydration, firming and elasticity. I’ve targeted it as my next “gotta have” skin care purchase. And here’s one for your kisser, St. Laurent Kiss and Blush, $40 a velvet finish blush that doubles as lip stain, matte but not drying. A makeup bag must for the perpetually pale and wan. This entry was posted in makeup, skincare and tagged Dr. Brandt Pores No More, Givenchy Le Prisme, Josie Maran, Kate Somerville, Kiehl's BB Cream, L'oreal Magic Lumi, Neutrogena Rapid Wrinkle Repair, No Bronzer Bronzer, Nu Skin ageLOC, Perricone No Foundation Foundation serum, Sephora, Skin Ceuticals, St. laurent Kiss and Blush. Bookmark the permalink. I love the product reviews! Thank you Zoe!